A Moderate Breeze (Force 4) blew the shingle plants around on Shoreham Beach to my distraction. 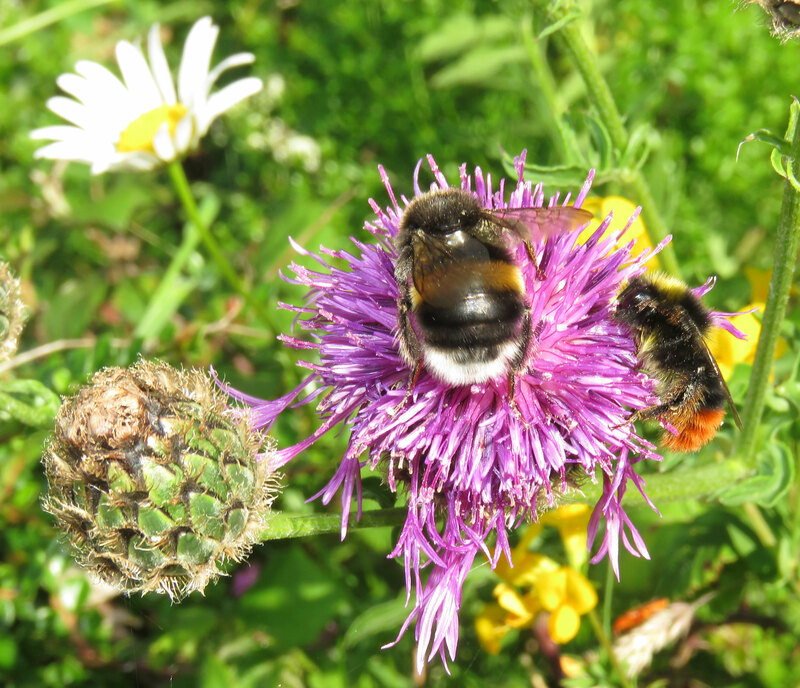 There were also smaller bumblebees than on Mill Hill, thought to be mostly Common Carder (Brown) Bumblebees, Bombus pascuorum, but also two larger ones thought to be a Red-tailed Bumblebee, Bombus lapidarius, and a Buff-tailed Bumblebee, Bombus terrestris. 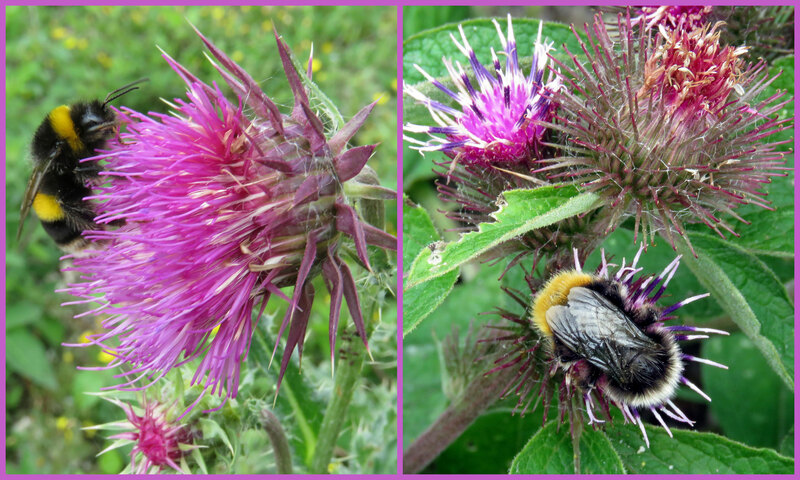 The highlight of a dull afternoon was a dozen bumblebees on a patch of Musk Thistle on the lower slopes of MiIl Hill. Identification of bumblebees is difficult and I have not mastered surefire identification in the field and often a photograph is not definitive. The smallest bumblebees I think are Buff-tailed Bumblebees, Bombus terrestris. 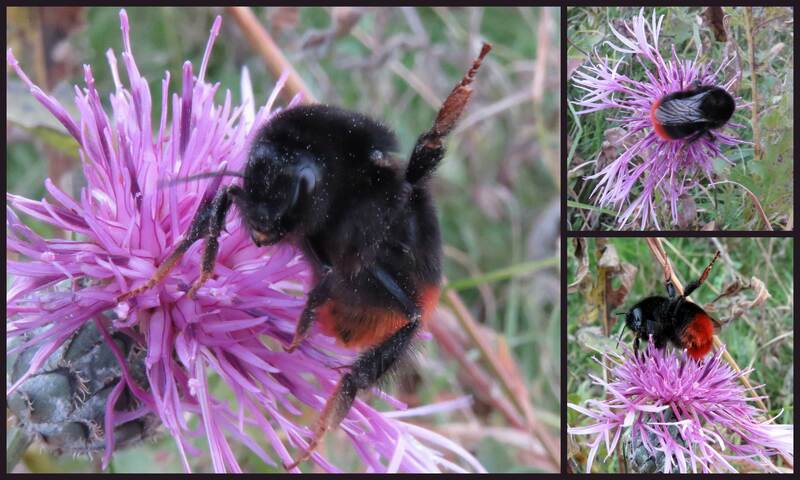 The first (top left) could be as well, but it might be a White-tailed Bumblebee, Bombus lucorum. In the bottom right, the large black one is probably Red-tailed Bumblebee, Bombus lapidarius, but iits very dark wings suggest the possibility of the Hill Cuckoo Bee, Bombusrupestris, which I have not recorded locally. The weather was pleasant enough to spot my first bumblebee of the year, a Buff-tailed Bumblebee Queen visited a flower shop in Lancing. Just the brief rays of the warm 10.2 °C sun under a blue sky was a pleasant spring day that brought out my first queen bumblebee, Bombus,of the year. Bumblebee on the Downs Link Cyclepath north of Old Shoreham. Common Carder Bee, Bombus pascuorum. Bumblebee on the southern upper part of Mill Hill. 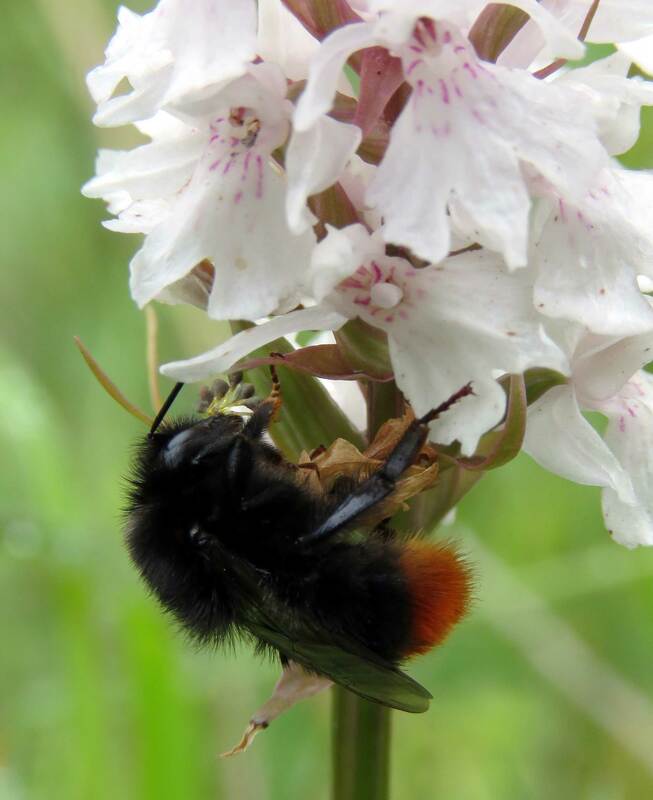 Red-tailed Bumblebee on a Spotted Orchid on the road verge at Buckingham Cutting (south). 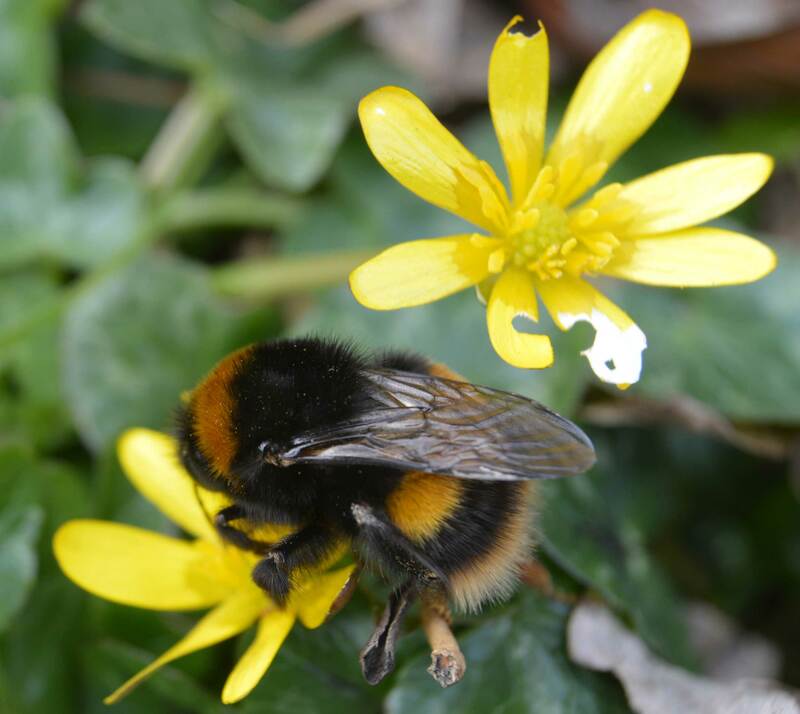 An inclement month drew to a close with a brief spell of weak sunshine with my first bumblebee of the year, a Buff-tailed Bumblebee visited Lesser Celandine on a verge outside the Health Centre in Steyning. 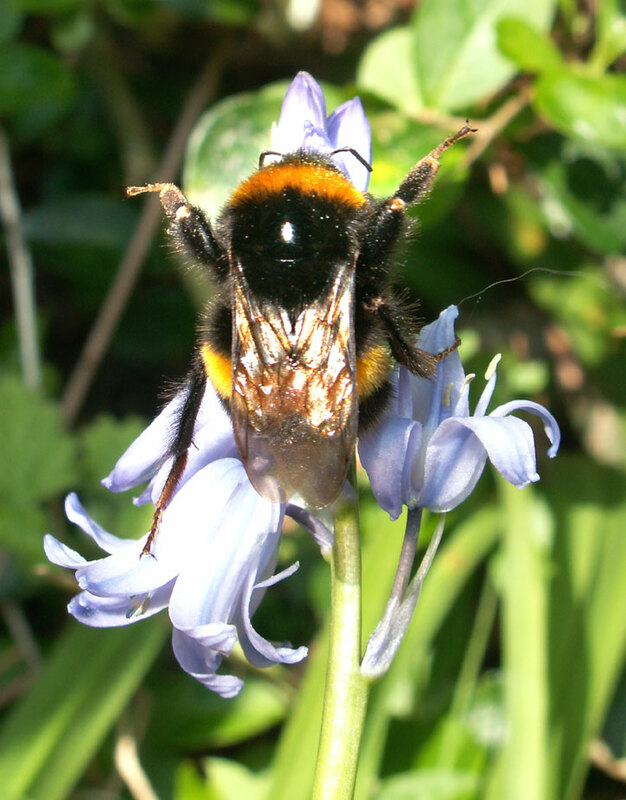 The first bumblebees were noted early in the month, and at least one a Queen Buff-tailed Bumblebee, Bombus terrestriswas spotted in a Portslade Cemetery. My first bumblebee of the year, a Queen Buff-tailed Bumblebee, Bombus terrestris, flew just above the cyclepath south of the Toll Bridge, Old Shoreham. 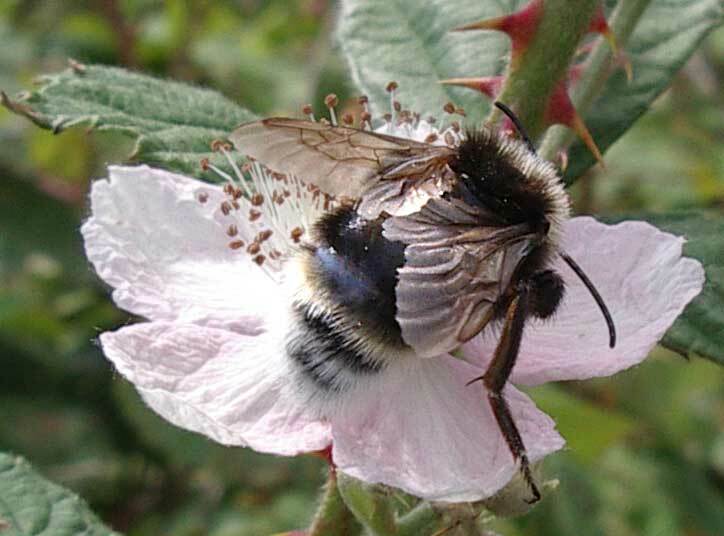 On a day most noted for its cloud formations, amongst the Bramble flowers on Buckingham Cutting (south) there were a few each of the bumblebees; White-tailed Bumblebees Bombus lucorum, Red-tailed Bumblebees, Bombus lapidarius, and Common Carder Bees, Bombus pascuorum. 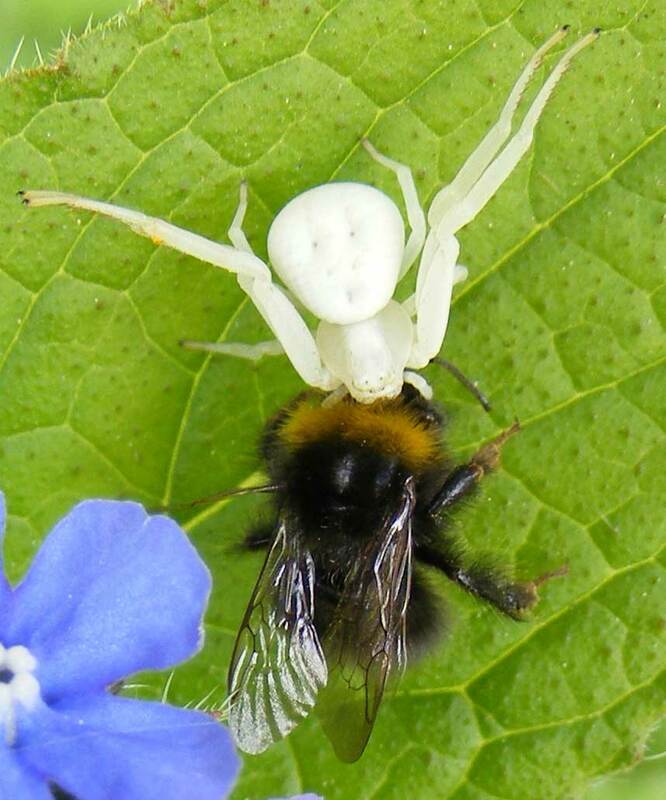 A small white crab spider Misumena vatia on Green Alkanet had ambushed and killed a bumblebee twice its size. The first of two Red-tailed Bumblebees, Bombus lapidarius, disappeared into a small hole on the lower slopes of Mill Hill. 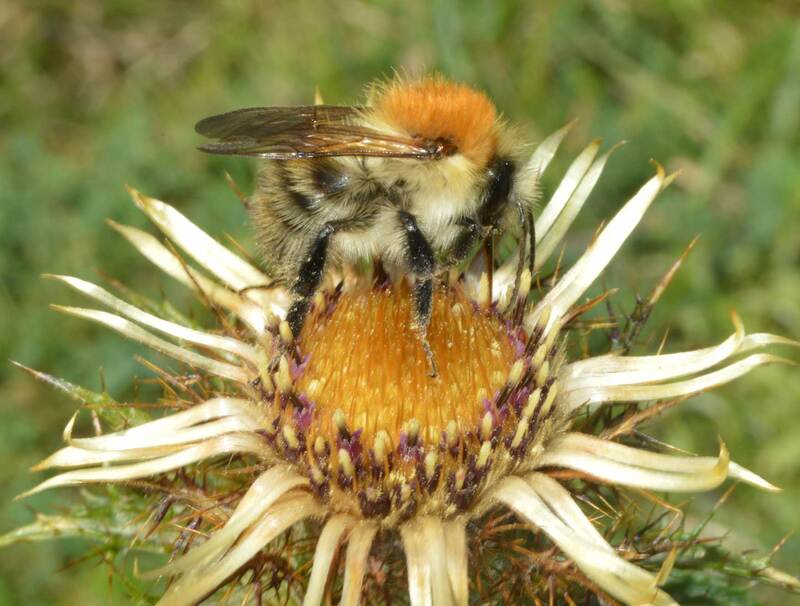 Carder Bees (bumblebees) were seen in Lancing on several occasions. The first bumblebee of the year, a Queen Buff-tailed Bumblebee, Bombus terrestris, visited Ropetackle east of Shoreham town centre by the River Adur. 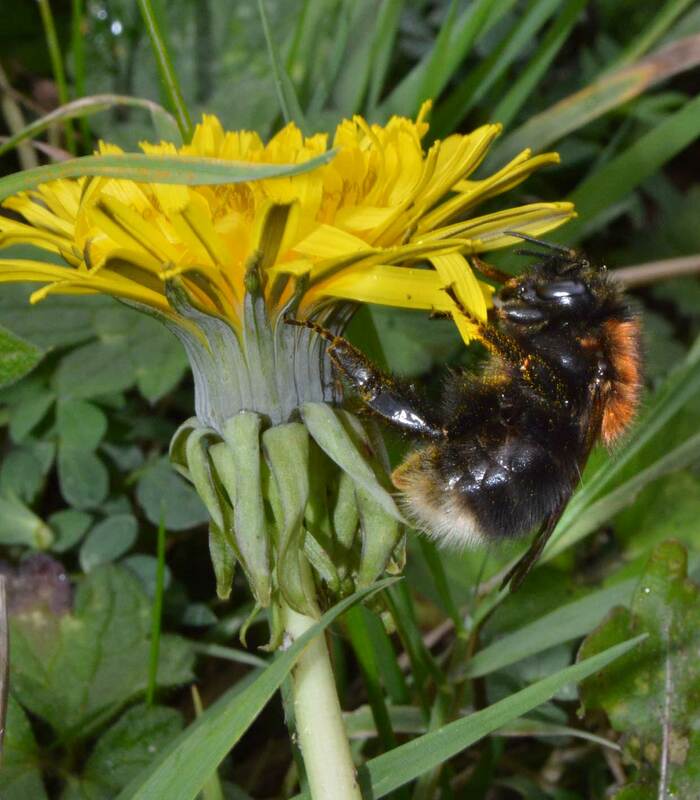 The first White-tailed Bumblebee, Bombus lucorum, of the year was noted visiting a Hardhead on the Coastal-Downs Link Cyclepath south of the Toll Bridge. The first bumblebee of the year, a Queen Buff-tailed Bumblebee, Bombus terrestris, flew out of the vegetation in a cleared space of the Hawthorn scrub in the north-west part of Mill Hill Nature Reserve. This was the only bee seen in the morning. 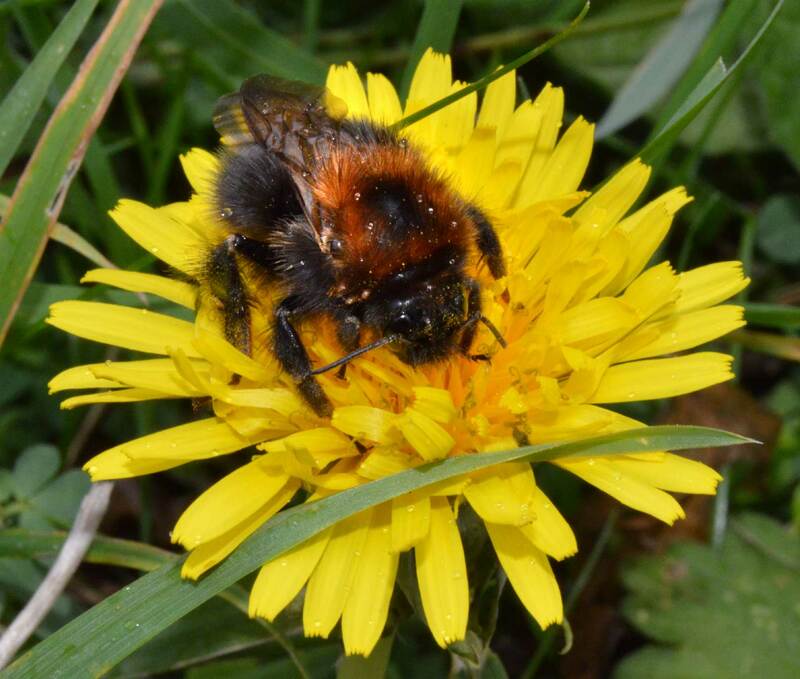 This small bumblebee was recorded on the on the Pixie Path, just north of Old Shoreham. I think this is the smaller male Red-tailed Bumblebee. My first definite Red-tailed Bumblebee of 2009 visited a Common Daisy on the footpath section of the Waterworks Road. My first Common Carder Bee visited a Daisy on the Pixie Path. 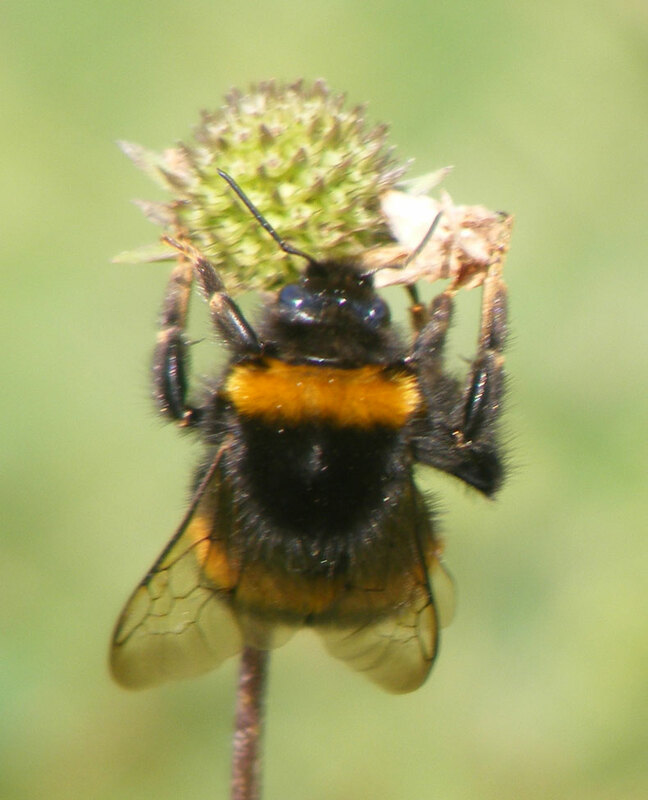 Although Buff-tailed Bumblebees had been frequent every day this month, a special large emergence occurred with at least thirty in five minutes rising from their burrows into flight from the grassy are at the top of Chanctonbury Drive, Shoreham, south-east of the bridge over the A27 to Mill Hill. A Buff-tailed Bumbleebee climbed up a stalk of Devil's Bit Scabious on the lower slopes of Mill Hill in the early afternoon. After I dislodged it, it crawled around amongst the herbs. 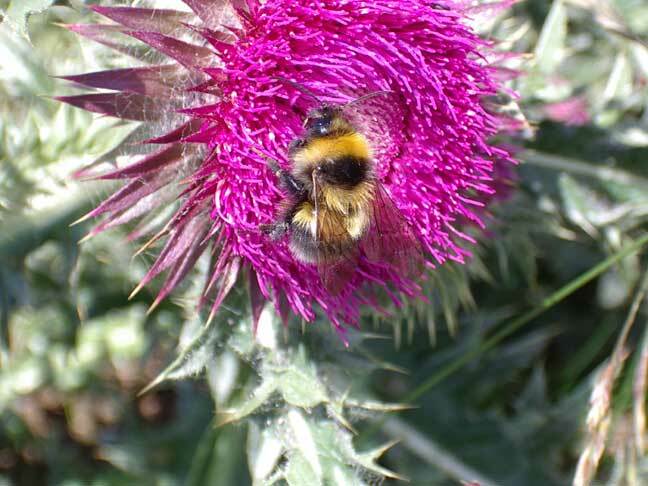 On the top of Mill Hill near the Reservoir, a Buff-tailed Bumbleebee visited a Musk Thistle still in flower. Red-tailed Bumblebees, Bombus lapidarius, and Common Carder Bees, Bombus pascuorum, were occasionally seen over a clearing on the south side of the Slonk Hill Cutting, choosing Red Clover to visit. 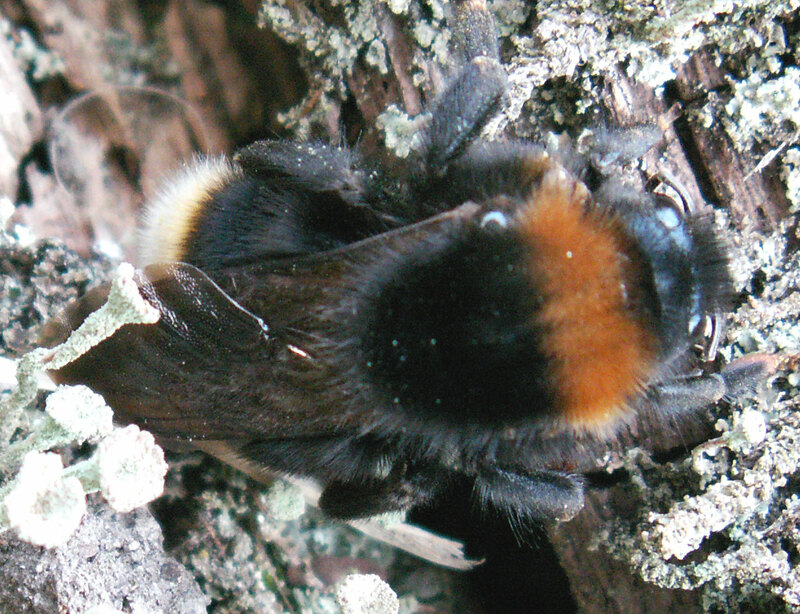 Red-tailed Bumblebees, Bombus lapidarius, were occasionally seen on Mill Hill, on the lower slopes. 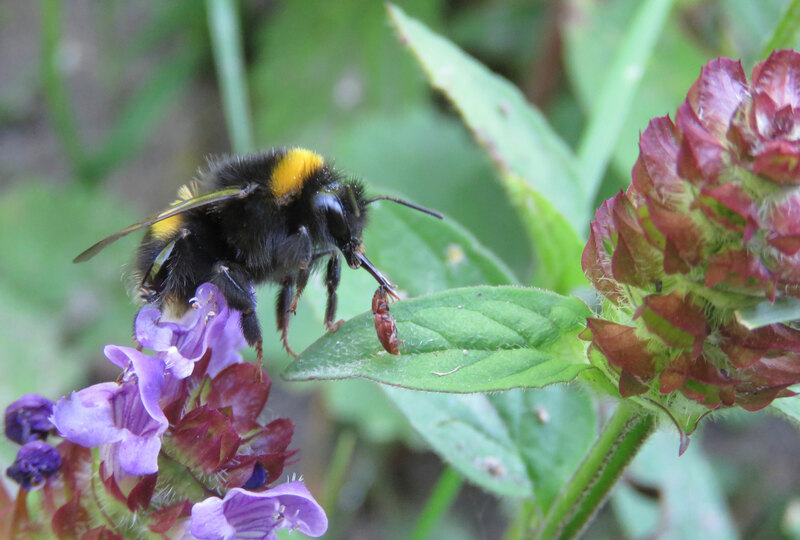 Common Carder Bees, Bombus pascuorum, were foraging and had been for at least a week before this mention. Buff-tailed Bumblebee, Bombus terrestris, on Bluebell in my front garden in Corbyn Crescent, Shoreham. 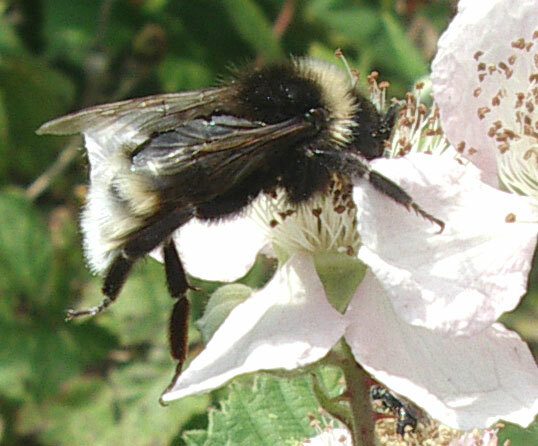 Red-tailed Bumblebees, Bombus lapidarius, were occasionally seen on Mill Hill, on the open downs and amongst the scrub. My first Red-tailed Bumblebee, Bombus lapidarius, of the year buzzed around the entrance to the linear spinney at the top of Slonk Hill Road. Later, another one was seen on the lower slopes of Mill Hill in the afternoon. 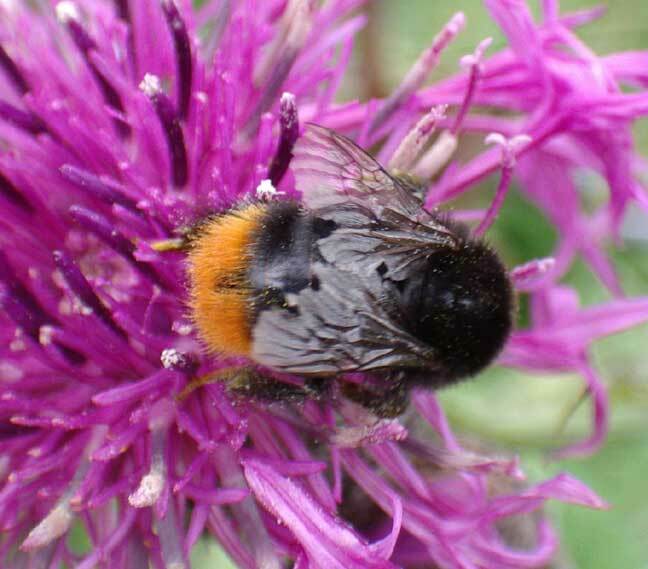 Queen Buff-tailed Bumblebees, Bombus terrestris, were frequently seen on wasteland on the outskirts of Shoreham. There were a few Queen Buff-tailed Bumblebees,Bombus terrestris flying around the ground vegetation on the Pixie Path. 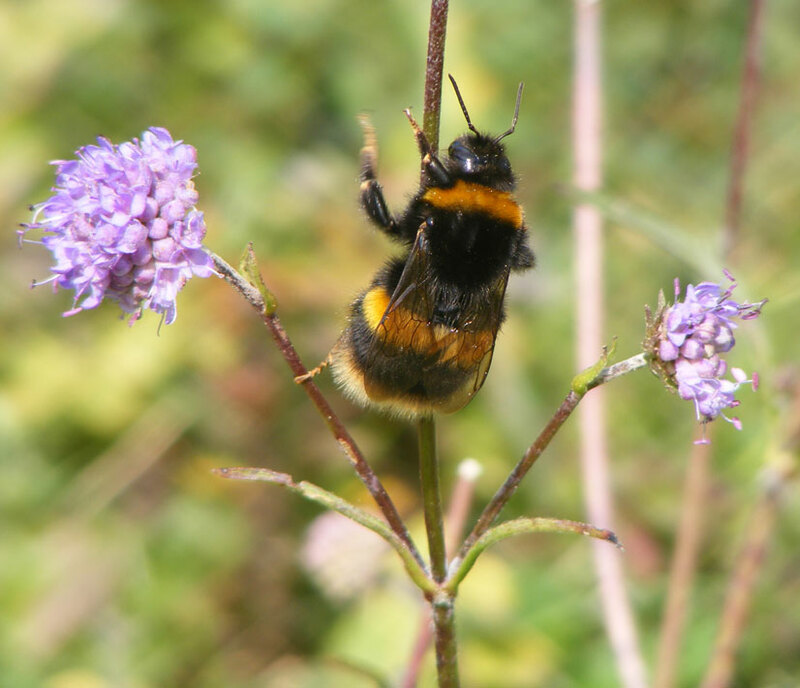 A definite Buff-tailed Bumblebee, Bombus terrestris, was seen flying over Lancing Manor near the buildings. Two large bumblebees were seen during the afternoon, the first almost certainly a queen Buff-tailed Bumblebee, Bombus terrestris and the second one on the southern part of Mill Hill was probably this species as well. My first large Queen bumblebee of 2008 flew rapidly away from me over Frampton's Field, Old Shoreham. It was not identified but I think it was probably a Buff-tailed Bumblebee, Bombus terrestris. Bumblebees were active on the Gorse bushes of Lancing Ring, probably male Buff-tailed Bumblebee, Bombus terrestris, showing the whitish tails and two yellow bars. I counted four individuals there was almost certainly more. The weather was warm and sunny, in patches between the rain clouds, at about 10 ° C.
A Buff-tailed Bumblebee, Bombus terrestris, flew over the railway crossing gates from Brunswick Road in Shoreham town. This bumblebee was half the size of the one seen nine days previously and may have been a worker? A Queen Buff-tailed Bumblebee,Bombus terrestris, visited a yellow Mahonia garden flower in a bed by the entrance to the Sussex Yacht Club building by the River Adur in Shoreham town. One large Queen bumblebee, probably a Buff-tailed Bumblebee, Bombus terrestris, flew at hedgerow height over Mill Hill Road between the bridge over the A27 and Mill Hill. At least two large bumblebees were seen visiting a few remaining flowers. 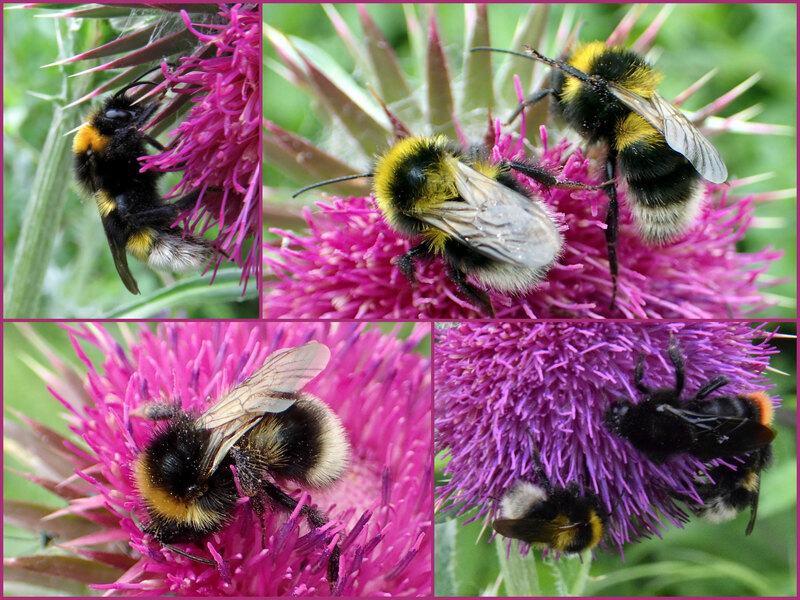 They were either Queen Buff-tailed Bumblebee, Bombus terrestris, or White-tailed Bumblebees, Bombus lucorum. 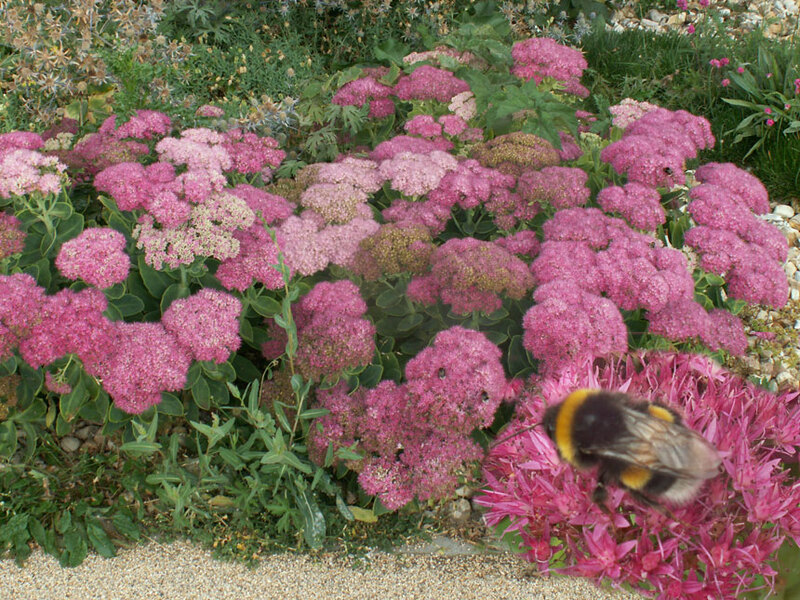 A dozen White-tailed Bumblebees, Bombus lucorum, visited a pink Sedum plant on Ropetackle. It was the Ice Plant, Sedum spectabile. 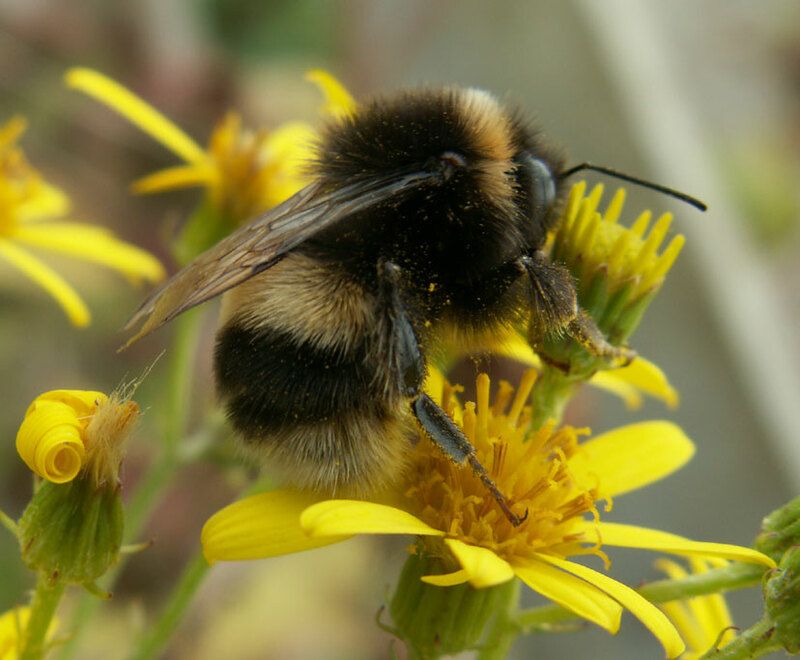 This bumblebee visited Ragwort on an overcast day on the Downs Link Cyclepath south of the Toll Bridge. I think this one is probably the White-tailed Bumblebee, Bombus lucorum, with slightly faded colours. 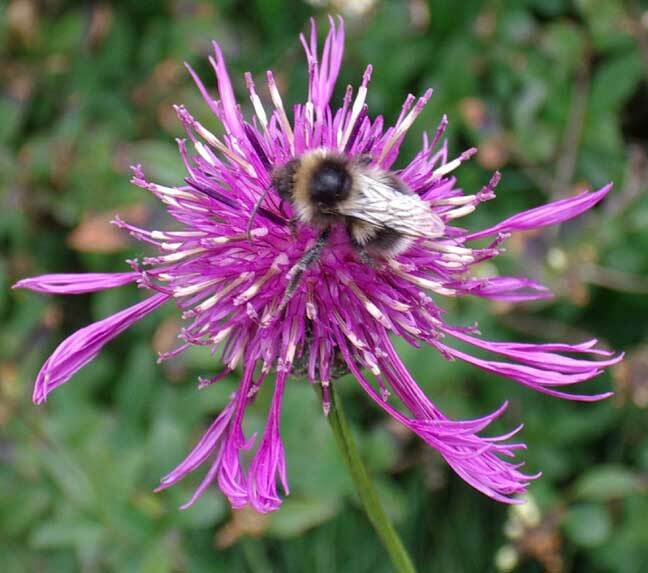 Frequent Common Carder Bees, Bombus pascuorum, visited purple flowers in Shoreham town. 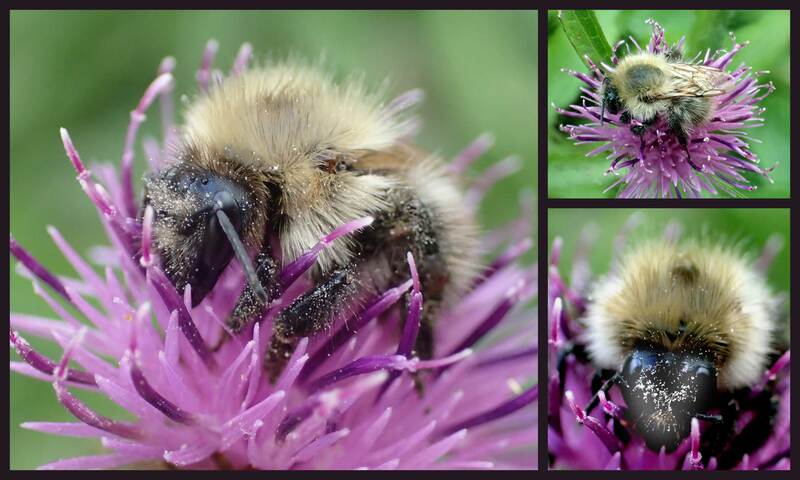 Common Carder Bees, Bombus pascuorum, visited Greater Knapweed on the Downs Link Cyclepath in the long grass and herb meadow south of the Cement Works. On to the Downs Link Cyclepath a White-tailed Bumblebee, Bombus lucorum, and a Red-tailed Bumblebee, Bombus lapidarius, both visited the handful of Perforate St. John's Wort in flower south of the Toll Bridge. 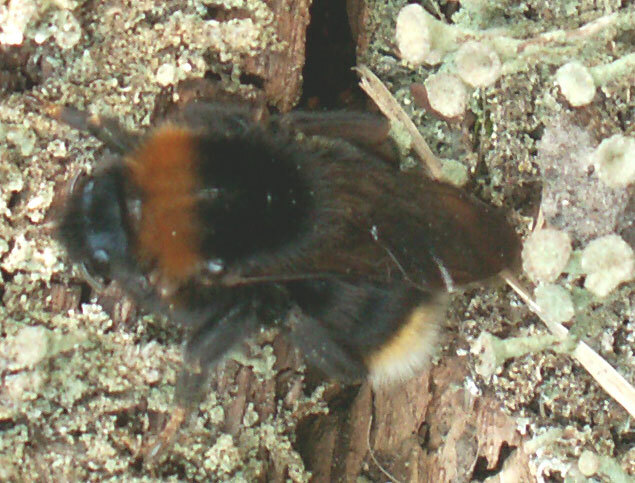 My first Queen Red-tailed Bumblebee, Bombus lapidarius, of 2007 was seen, much later than usual this year. It was buzzing around the herbs at the northern end of the lower slopes of Mill Hill. 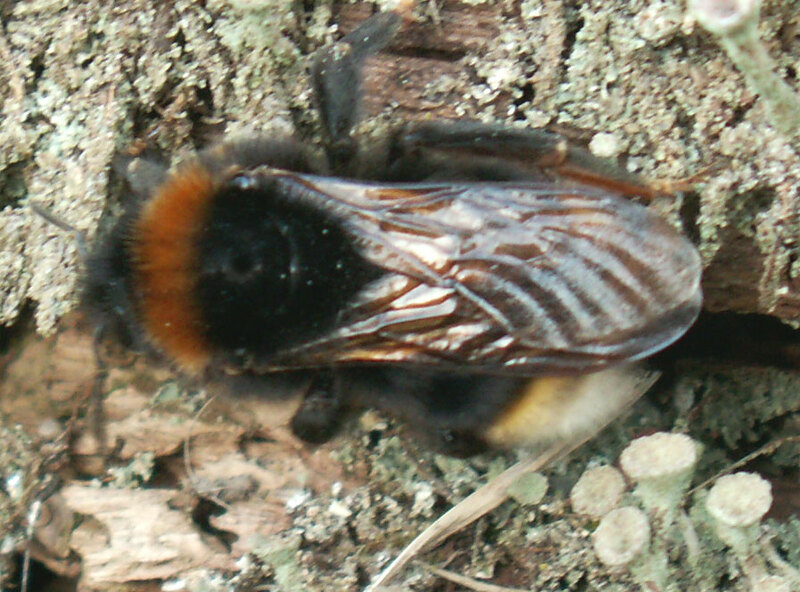 My first Common Carder Bee Bombus pascuorum of the year, with a furry orange thorax, was seen on the Waterworks Road. The only bumblebees seen in warm weather about town and on downs were occasional Buff-tailed Bumblebees, Bombus terrestris. This picture confused me at first. It is just one bee on the Pixie Path to Mill Hill. The Queen had a white tail with slight V-shaped black markings a thin lemon-coloured band and an orange band near its head. This bee was attracted to a hole in the rotten lichen-covered wood. My first choice of species was Bombus vestalis, but it it is a bit early for this cuckoo bee. The brownish wings were rather distinctive. This is a Bombus terrestris queen. I admit the description sounds like B. vestalis, but the pictures show the basal darker band of B. terrestris, not the patches of B. vestalis. It is not absolutely too early for B. vestalis as it, like its host, has been getting rather earlier, however I have seen only one or two quite this early. A picture of the hind leg would be a good idea and clinch it. A Buff-tailed Bumblebee, Bombus terrestris, was seen ten minutes before the cuckoo bee about two metres from the same location. In the Hamblett's south Lancing (TQ 186 044) front garden, a smallish bumblebee with a bright white tail briefly visited the flowering Rosemary by the front door. I was unable to remember the patterns to discern which bumblebee (or mimic) species but it did not seem to have any lemon-yellow of the White-tailed Bumblebee, Bombus lucorum, nor the familiar appearance of the Carder Bee, Bombus pascuorum. It would be too early for the Carder Bee. It could have been the Small Garden Bumblebee, Bombus hortorum (but this has not been confirmed). There were well over a dozen queen bees in two hours, but they were all Buff-tailed Bumblebees, Bombus terrestris. Bumblebees were being seen at about one a day when I was out (once every two days) this week. A Buff-tailed Bumblebee, Bombus terrestris was recognised over the Coastal Link Cyclepath south of the Toll Bridge and I think all the bumblebees seen have been this species. A bumblebee buzzed out of the St. Mary de Haura churchyard in central Shoreham. It was too quick and unexpected to be identified positively, but it was probably a Buff-tailed Bumblebee, Bombus terrestris. 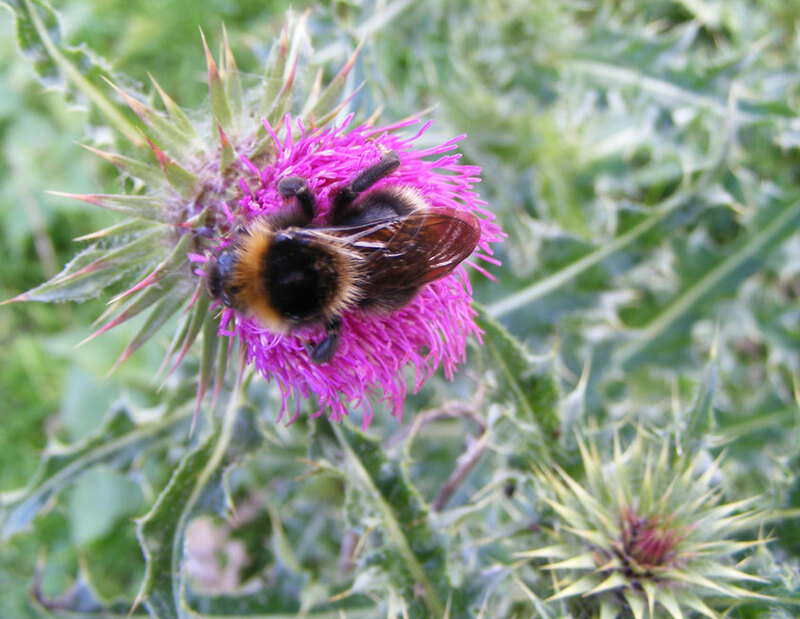 Bumblebees have been seen on most of the bright days during this exceptionally mild month. Both a queen and worker Buff-tailed Bumblebees, Bombus terrestris, were seen in the front garden. Rosemary and Euryops were in flower which provided the attraction for the bees. 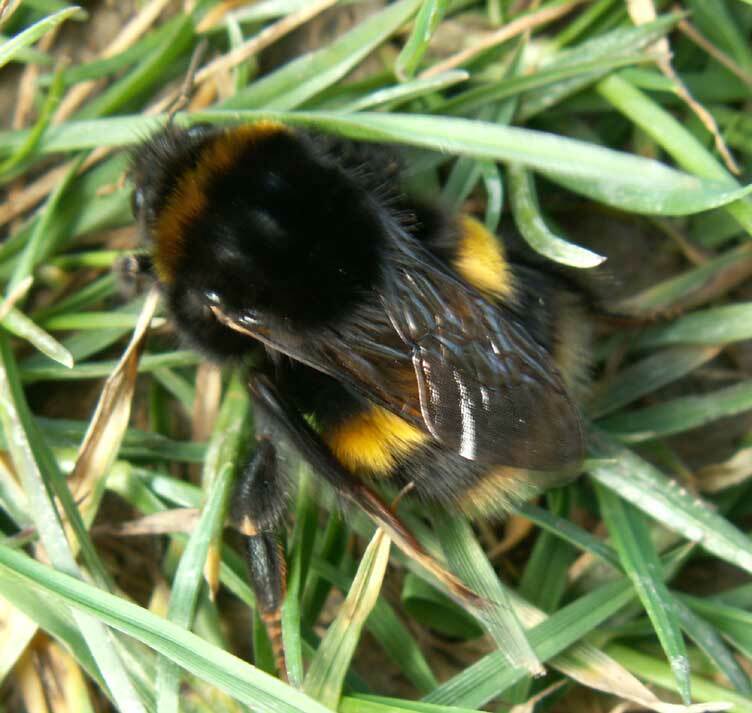 My first bumblebee of 2007 was a Queen Buff-tailed Bumblebee seen flying away from some vegetation over Frampton's Field, Old Shoreham, at the southern end near the Butterfly Copse leading to the Waterworks Road. A Queen Buff-tailed Bumblebee flew into the bushes to the south of the Riverbank houseboats on the River Adur estuary at Shoreham. I doubt if it will be last of the year, but I have made a note of it in case it was. On the lower slopes of Mill Hill, the Devil's Bit Scabious also attracted a Common Carder Bee. 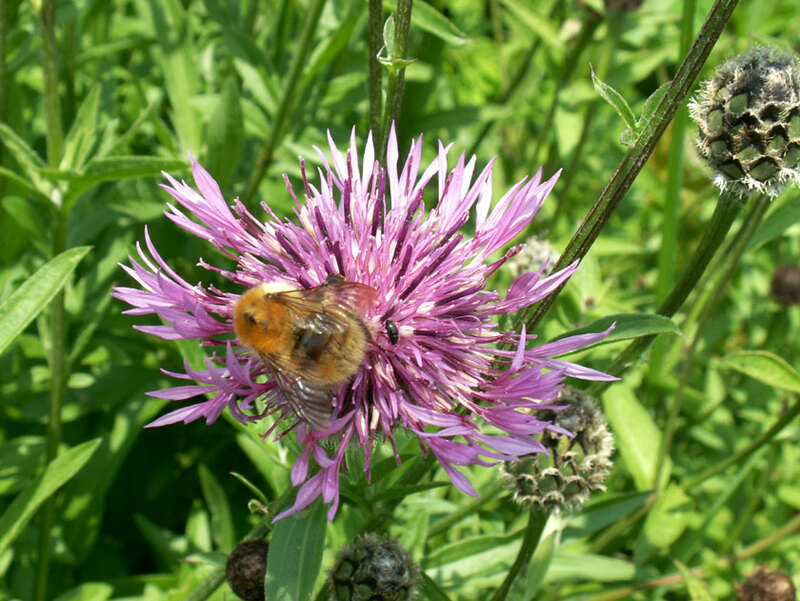 Two Greater Knapweed flowers on the Pixie Path verges attracted a Common Carder Bee Bombus pascuorum. I have not been recording the bumblebees during the hot summer. A species of Copop fly was discovered near the Butterfly Copse next to the Waterworks Road. It is illustrated on the hoverflies page, but it is not a hoverfly. Conops quadrifasciatus is a wasp mimic and NOT a hoverfly and its larvae are internal parasites of bumblebees. A Common Carder Bee Bombus pascuorum, was very keen on visiting a foreign Deadnettle in a north Shoreham garden. My first Common Carder Bee Bombus pascuorum, of the year was seen buzzing around the verges of the Waterworks Road, Old Shoreham. 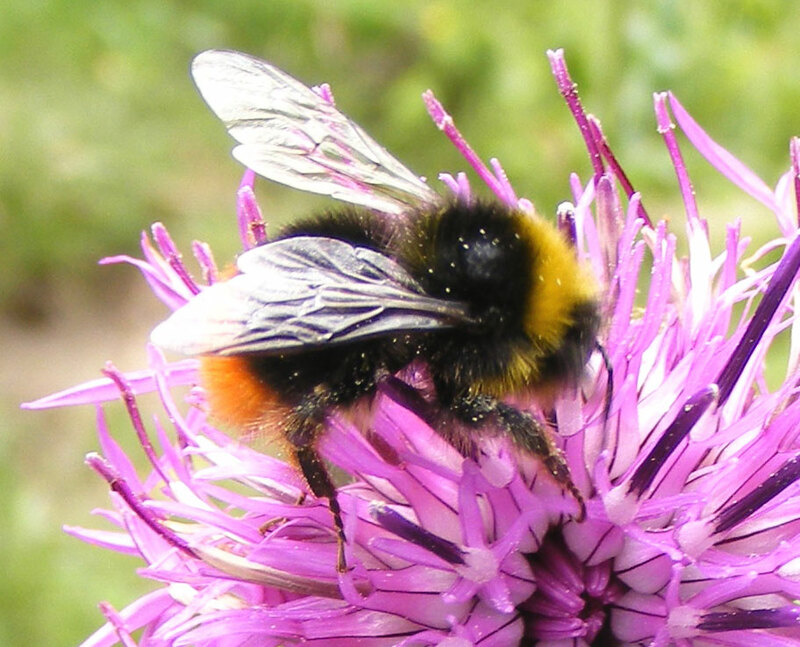 The Buff-tailed Bumblebees are seen in the proportion of about 100/1 compared to Red-tailed Bumblebees in favourable location of bumblebees between 20 and 33 an hour. Queen Buff-tailed Bumblebees were seen every ten minutes or so on the Worthing, Lancing and Shoreham beach cyclepath, altogether about twenty were seen at regular intervals. All flew at under four metres and mostly about three metres from the ground. Spring has finally arrived under a blue sky with the warm rays of the afternoon sun. 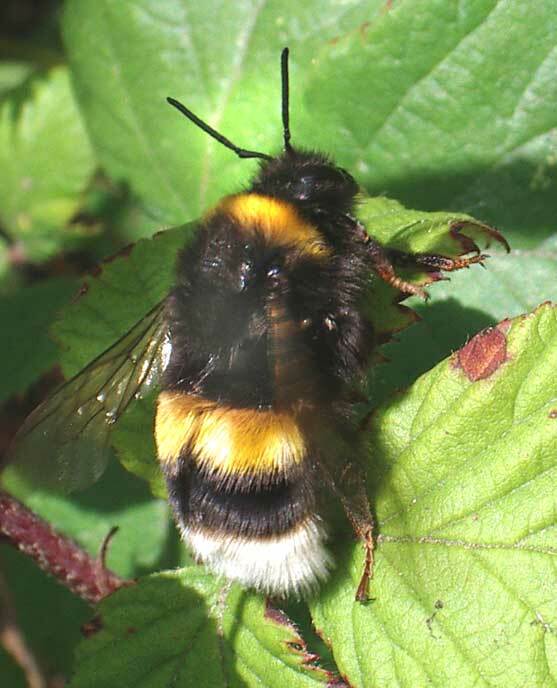 A dozen or so Queen Buff-tailed Bumblebees were seen as they crawled from their holes in the ground in McIntyre's Field (east of Lancing Clump) before buzzing off at a height of about four metres above the ground. A Red-tailed Bumblebee, Bombus lapidarius, flew into some long grass at the east end of Widewater Lagoon. 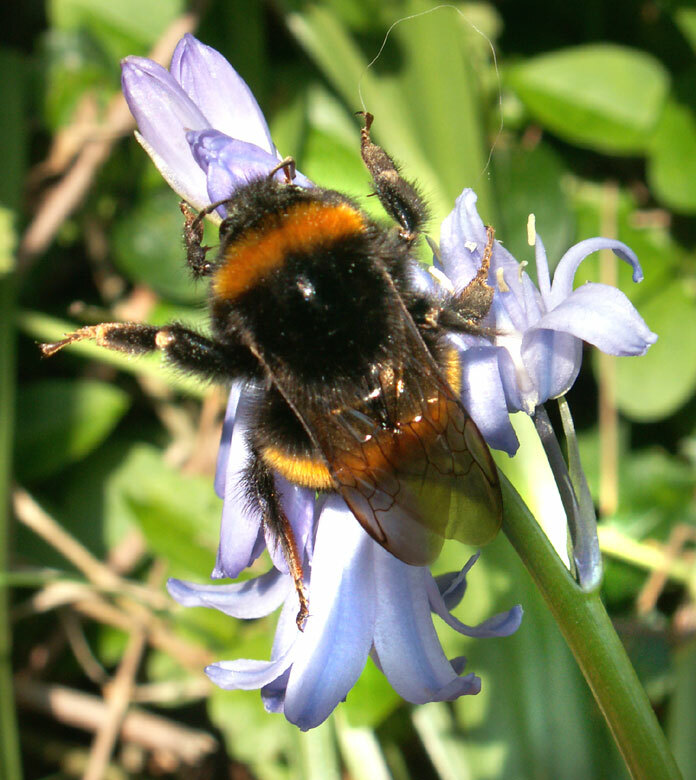 A Queen Buff-tailed Bumblebee crashed into the kitchen window twice in a Shoreham garden near Buckingham Park. A single bumblebee buzzed around the rockery by the garden pond in a Shoreham garden near Buckingham Park. I went to look for it, but it disappeared before I had a chance to identify it. I thought it was a Red-tailed Bumblebee, Bombus lapidarius, but it could have been a Buff-tailed Bumblebee, Bombus terrestris. The first definite bumblebee of this year was a Buff-tailed Bumblebee, Bombus terrestris, on the winter flowering Jasmine in my south Lancing (TQ 186 044) garden. Glimpses of bumblebees had been seen earlier in the month though. Apart from the common seven species in bold print on a green background, the rest of the bumblebees on the British list are uncommon, even on the edge of extinction (red background) or northern species (mauve background). The species with a grey background is widespread in Britain but under-recorded because of ID problems. The others are local or rare. Bombus cullumanus Cullum's Bumblebee Not recorded. Extinct in the UK? Bombus distinguendus Great Yellow Bumblebee Not recorded. Found only on Scottish islands. * ID still awaiting confirmation. These may be worn Bombus pascuorum? 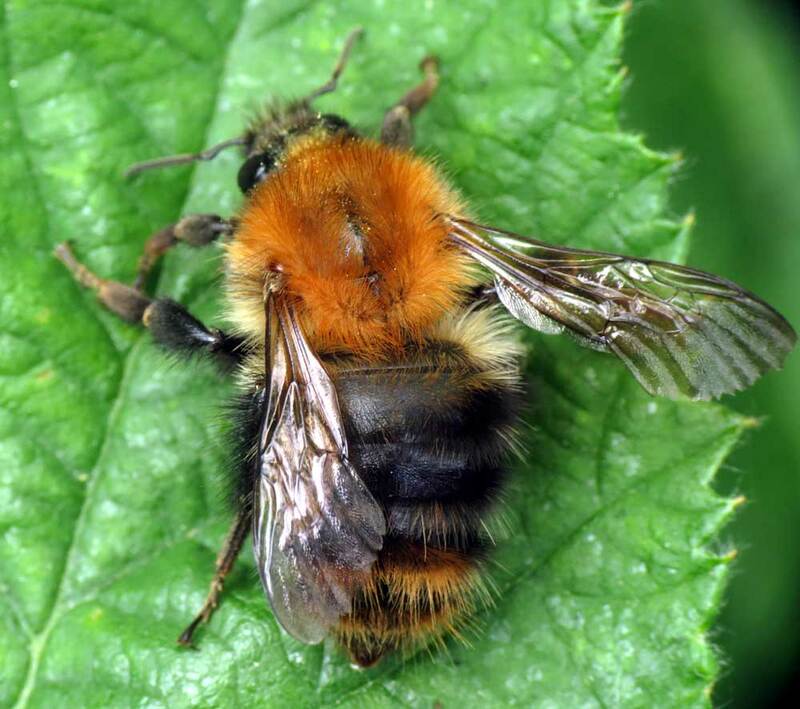 Psithyrus is now known as Bombus. The hind tibia is convex in shape...and therefore a cuckoo bumble. The identity of these bumblebees need confirmation.